how is it may already?! 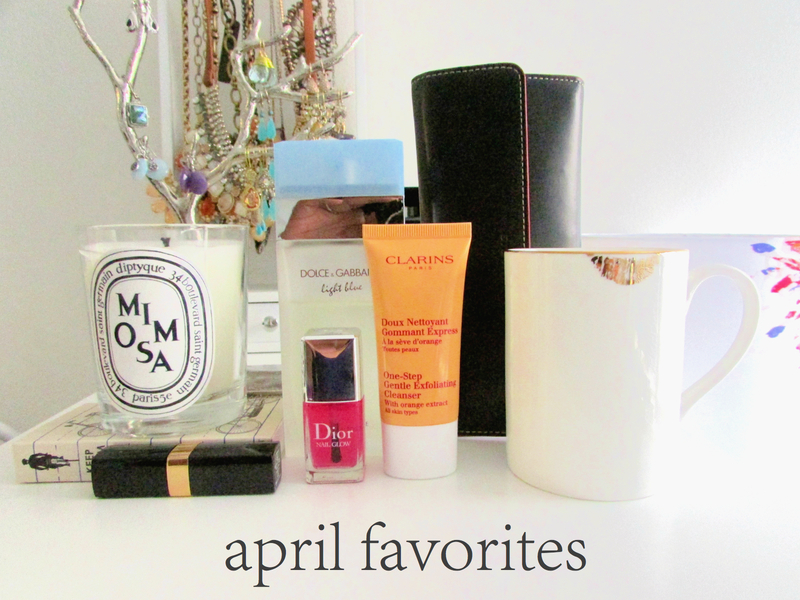 april flew by, and it’s time again for a recap of the past month’s favorites. diptyque mimosa candle | my go-to spring candle. it’s light, airy, and oh-so-lovely. I’ve been enjoying this in the evening about an hour or so before I head to bed. chanel rouge coco shine in antigone | a lovely raspberry red shade in an easy-to-wear formula. this is almost always one of the lip products in my handbag – it applies sheer but can be built up, it’s not too light but not too bold, and it’s incredibly quick and easy to apply. it’s a good all-rounder. plus, I bought this in South Korea on my way to the Philippines, so it always brings back good memories whenever I use it. dolce & gabbana light blue | my spring/summer fragrance is now in heavy rotation now that it’s warming up (slowly). I love the tart citrus scent that reminds me of a hot day spent on the water. dior nail glow | I’ve been so busy lately that painting my nails hasn’t been an option. to keep them looking polished without having to find the time for a proper manicure, I’ve been slapping this on. it gives my nails the most flattering pink hue – like my nails have been taken care of, even though nothing could be farther from the truth these past few weeks. I picked this up on the recommendation of a friend who swears by it. I initially balked at the price tag, but after using it over and over this past month, I’ve definitely gotten my money’s worth. clarins one-step gentle exfoliating cleanser (sample size) | aside from my nails, I’ve also been slacking on the skincare routine, and my face is rougher than I’d like. this cleanser has been on heavy rotation the past month to help offset the effects of my neglect. it’s effective but gentle, and my face feels incredibly smooth after I use this without ever feeling stripped. reiko kaneiko lip tease gold mug | such a cheeky little mug! I saw this mug on a post by Lydia on her blog months ago, and it immediately caught my eye. the mug is quite slim and feels delicate in the hand. I drink way more coffee than this mug can hold at a time, so I’ve been using this for nightly cups of tea. lodis audrey checkbook clutch wallet | I’d been looking for a black wallet for ages, and I’d never found one I liked enough to buy until I saw this one. I love the contrast red lining and the lack of extra hardware – simple and functional. 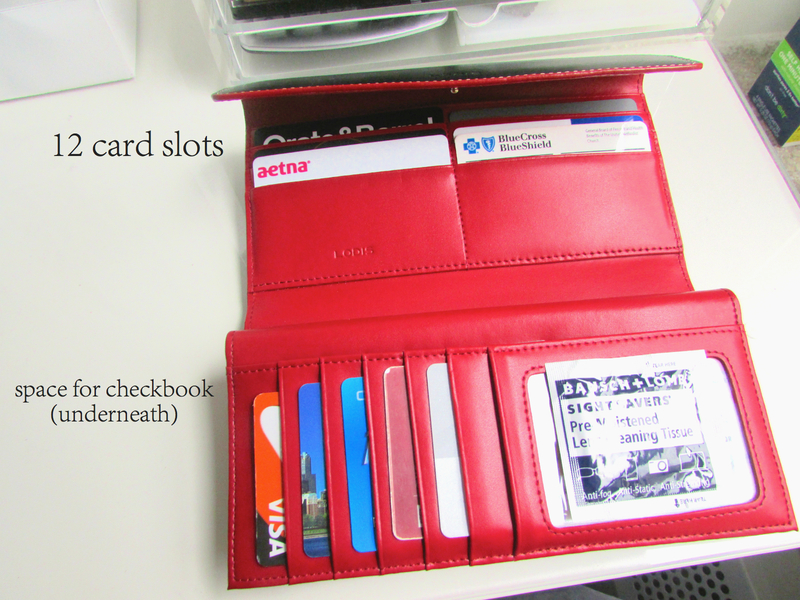 it has an insane number of card slots and pockets, plus it has a designated spot for a checkbook. what sealed the deal for me was the fact that it had all of these features and still managed t0 be quite slim. and on top of all that, I found it on major sale for under $30! Awww, the lip tease mug! I hope you are loving it as much as I am (yes, the mugs were among my many birthday surprises)! I saw a picture you posed and saw a box from Gramercy & Co and I was hoping you got a set for your birthday! So glad you did!